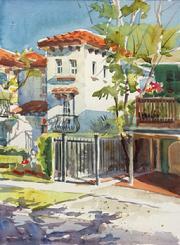 Plein Air workshop in Watercolor & Acrylic Mediums! 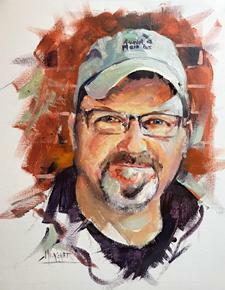 All mediums welcome though Spencer will demo only in Watercolor & Acrylic. tend to avoid the details and let the color and value tell the story." over the country attending competitions and shows, as well as, teaching workshops. he is not traveling he works out of his studio in Mt. Vernon, IL. mentioned in numerous online articles. Spencer has studied with renowned artists Alvaro Castagnet, Graham Berry, John P.
Lasater IV, Joseph Fettingis, Lon Brauer, M. Shawn Cornell and Sterling Edwards. and from Cortona on (New Dates Coming Soon! ); times to be announced. *All-inclusive plans are Hotel only. students confidence allowing for an easier transition to painting in a public setting. with palettes that dry much faster or slower depending on the weather. importance of making strong compositions from the “live” scene before them. anticipate completing one quarter sheet painting per day. Suggested listing of supplies - feel free to bring anything you like to paint with. Paints – bring the best you can afford. different manufacturers may vary some. something similar to these don't spend money buying brushes just for this workshop. recommended, 140# acceptable but may buckle a bit, watercolor blocks are good. Bring anything else you like to paint with. Palette - I use a glass palette attached to my tripod. Another option is a plastic "staymoist"
well. Bring what you like to use. Broad brimmed hat for shade. sit on. Lightweight and collapsible is best. KINDS of weather. Be prepared.